Australian colonisation. 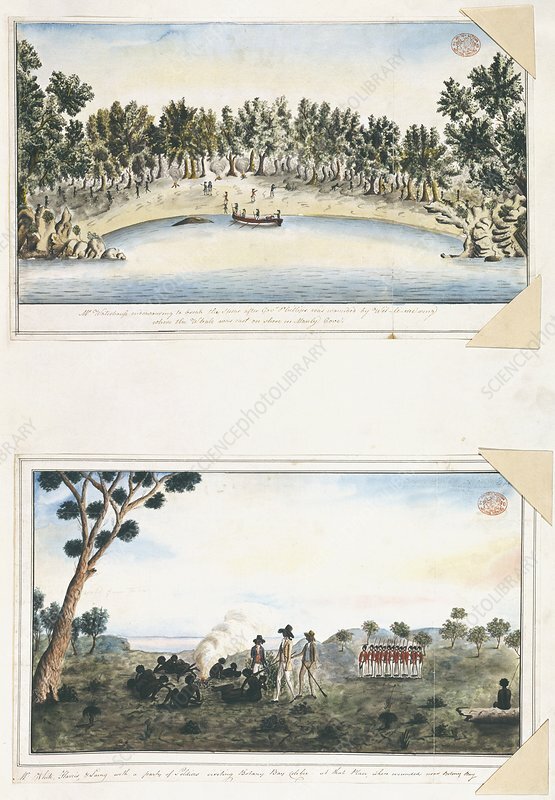 Artworks of two 1790 scenes from the early period of Australian colonisation. At top is the incident where the Governor of the new colony of New South Wales, Arthur Phillip, was wounded on 7 September 1790 by Australian aborigines in a cove near what is now Sydney. For another artwork relating to this incident, see C012/2006). At bottom are colonial soldiers carrying out reprisals against aborigines a few weeks later, following another incident. For more detail on this incident, see C010/1875. These are drawings 24 and 25 from the Natural History Museum's Watling Collection.